No known cover variations exist. Yo! Here's the deal. I won the Krusty the Clown art contest so my family and I get to go on this really cool Worldwide treasure hunt to China, Egypt, the North Pole and Hollywood. And I need you to help collect Krusty faces and Krusty products if I want to reach my final destination, a guest appearance on the Itchy and Scratchy Show! Any questions? Good, I'm outta here. 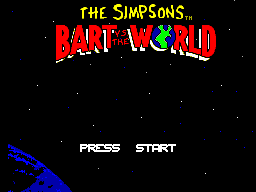 Your friend, Bart Simpson. On the first level, go all the way to the left on the junk. Fall down along the column. You will find Maggie sitting on a small platform. Touch her and the Krusty Junk will appear. 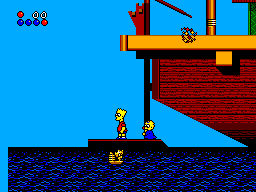 In the second level, while skateboarding you will see Lisa standing on the top of the wall. Jump to touch her. After the second tower, on the way down, the Krusty statue will appear near the top. Jump to get it. In the Ice Cave, when you climb up the ice blocks in the first section, you'll see Marge standing in the ice. Get close to her and she'll toss snowballs. Jump up to hit them and they will dislodge the Krusty the Snowman doll behind her. Descend to get it. On the ice river, you will eventually see Krusty the Ice Cube on top of an igloo. This part was a mistake in the programming, it was supposed to be hidden inside, found when you used the cherry bombs that Lisa gives to you right before. 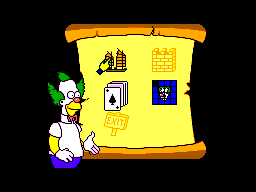 There is no pyramid level in this version and thus no Krusty item to be found in it. In the Valley of the Kings, when you come to the shaft to fall down, jump hard to the right and land in the first room on the right. Maggie is in there with some tornados. Destroy them to save her and get the Krusty sand sculpture. On the Sphinx, save Homer and a Krusty the Sphinx doll will appear in its mouth. 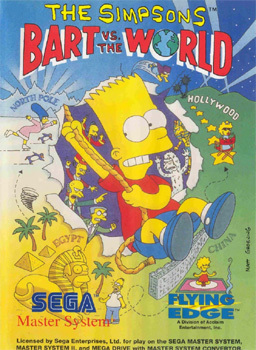 If you fall, use the Bartman icon to get it. On the pirate ship, you will eventually come to Maggie on one of the masts. Touch her and a Krusty the Pirate flag will come down the pole. Unfortunately, this version is incomplete. The final Krusty doll does not exist in Soundstage 2.